I have to admit, when I saw the name of these little chewies I chuckled. Just a little too cutesy for this post-grunge cynical candy reviewer. If it was named, say, “Taffy Triage” you can bet my interest would have been piqued. Still, what’s in a name? A rose by any other name would smell as sweet. Let’s put the preamble aside and dive right in. This taffy is damn good. Now I don’t know who is going out and buying taffy. I tend to consider purchasing only when I’m in candy specialty shoppes and see the barrels of flavors for mix and match bags. Taffy Town is making me think again about this (non)strategy. They are also made with no added colors so the bag of blueberry, for example, are various hues of light blue, not some lab-created aqua tourquoise you would find in big batch candies. It makes me think these things are homemade – or at least ‘small kitchen made,’ which I like. 1. It’s made with sea salt. Original taffy (when it was invented) wasn’t actually made with salt water but rather it was made near the sea and essentially marketed that way to unsuspecting children. But Taffy Town puts sea salt in theirs, and it’s good. This just in: salt makes things taste better. 2. The flavors taste real. Banana is made with banana puree. Blueberry is made with blueberry puree. The mango was subtle but when it kicked in as the taffy became chewier, it became more apparent and didn’t taste fake at all. The raspberry is actually fruity tasting. Like, almost juicy. We were sent banana, blueberry, mango and raspberry. Kinda funny because I think most people don’t like banana candy, and mango is not usually a goto either. But actually, good choice for them to send us these ones because a simple vanilla, chocolate or peanut butter may not be as easily differentiated from other taffies. Also note that these 4 flavors appear to be part of their Simply Taffy line. 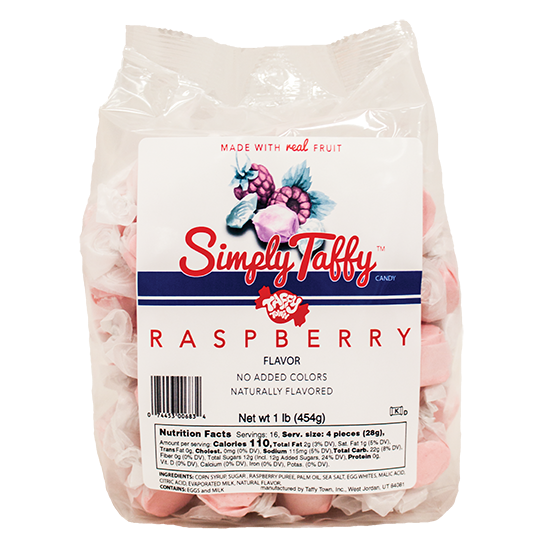 Not sure the difference these are with the other loads of flavors Taffy Town produces, though. So yes, I may not have approved of the “Taffy Town” name change (OG name was Glade, FYI) if I was part of the family who started making these candies 100 years ago, but I sure do approve of the taste. Buy a bunch of bags, put them in bowls, put around the office, and make more friends. I noticed that too. Will ask their PR guy about this. Stay tuned. Love taffy! I tend to buy it only when I see it though, especially if I can find it in a local candy shop. If you’ve still got any of that wonderful taffy left, I’d definitely throw my hat in the ring for one of the lucky “sh*t ton of taffy* recipients of the year. I always wonder if readers pay close attention to the reviews and see things like ‘comment and I’ll send you some.’ Nice job Scott – sending you some! Email us your snail mail address http://www.candygurus.com/email-us/. If taffy is still up for grabs, I’d love a piece or two! 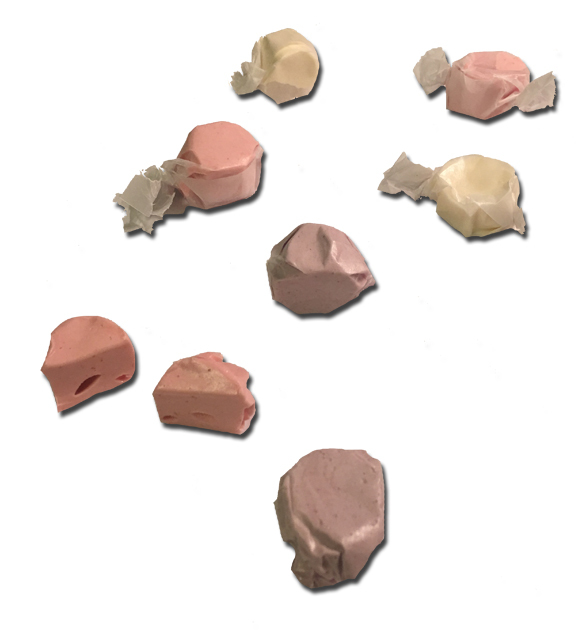 Now I’m wondering if you could seal a letter with a piece of melted taffy, like a wax seal. Well, Jocelyn, as luck would have it: yes, email us your snail mail address and will send you some! And the letter sealer idea is trippy enough that it just might work! Matty, thanks! And thanks for sharing your great posts every week! As one of the kosher-keeping 2%, I’d love to try some. YEAH YOU ARE LEAH _ BOOM! BRING IT! Unfortunately, my last batch went out. HOWEVs, Jonny appears to have secured some batches of whacky flavors from Taffy Town for a follow-up, and if he’s a kind person, perhaps he will share with the rest of us?